We had a great time reviewing the last Schmidt & Bender scope we had here so we figured it would not hurt to take a look at another one and see how it compared. The 4-16x42mm version this time around has different knobs, illuminated reticle, as well as a different reticle. It is also setup with MilRad knob adjustments. We have been extremely impressed with all of the S&B scopes we have used and we expected no different from this one, but we figured we had better run it through our set of tests just to be sure. As with all of the S&B scopes that we have handled, this scope has a nice solid feel to it and everything seems to say “quality”. The finish is very uniform and even across the entire scope, the machining is very precise, the lettering crisp and clear, as well as many other quality touches. It just has a feeling of precise engineering and manufacturing, something the Germans are well known for. The tube is 34mm, which most of the S&B scopes are, and the lines with the 42mm objective look good. 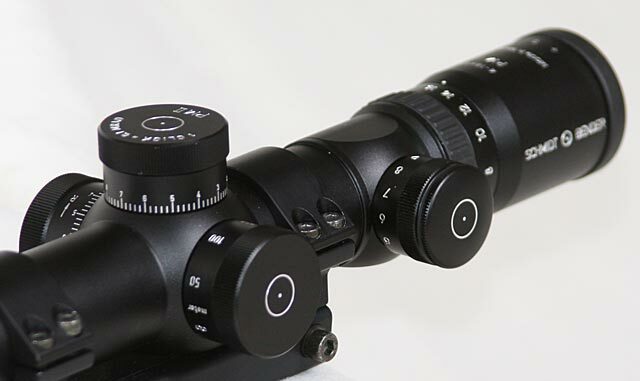 It is a very nice looking scope, not that that is important, but hey, we all like our equipment to look good as well. The matte anodized finish is just about right with minimal reflection, though that nice crisp lettering (probably laser etched) does stand out quite well and is easy to see, both by the operator and anyone else. The rear eye piece has a fast focus eye piece that is smooth and fairly easy to rotate. It adjusts through the standard dioptre range and allows you to focus the reticle to your particular eyes, with or without glasses. Just ahead of the eye piece is the power adjust ring which has a rubber ring around it with serrations and a single larger protruding knob, all to aide with gripping the power ring while behind the scope. It provides excellent grip and the power ring itself provides a good feel, not too stiff to making adjusting difficult, but yet stiff enough to keep it from moving to easily by accident. It is very smooth and requires the same amount of force throughout the adjustment range. 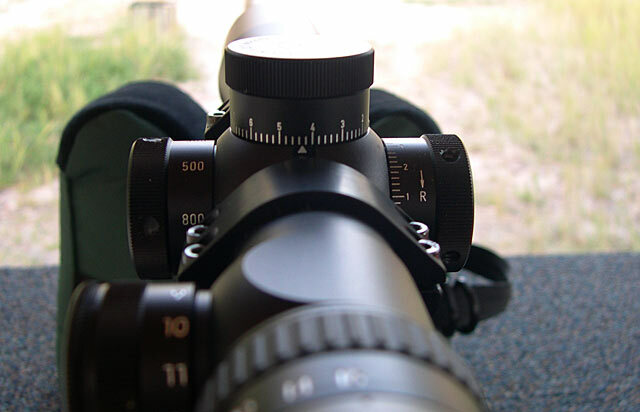 The numbers on the ring are flat and not easily read from behind the scope, requiring just a minor lifting of the head to see where you are at. 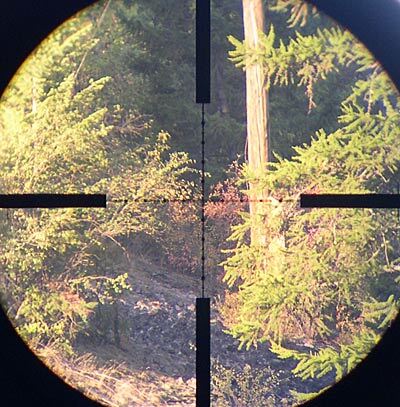 But the use of the first focal plane reticle diminishes the need to know exactly what power the scope is set to. The eye relief is generous and there should not be any problems using the scope on higher power rifles. Just ahead of the power ring and on the left of the scope is the illuminated reticle brightness adjustment knob. There are 11 brightness levels, 12 if you count 0, which are clearly marked on the knob as well as very positive detents as you click to the different settings. The knob itself does block your view of the side focus knob, but this is much more desirable than blocking the view of the elevation or windage knobs. The need to see the numbers on the focus knob are less than the elevation or windage knobs making the left side placement probably ideal. The usefulness of illuminated reticles are handy and the fact that the scope is still completely usable if the lighting portion of the reticle fails or the battery dies in the field, makes it a nice feature to have without much down side. Ahead of the illumination brightness knob is the knob that it obscures, the side focus knob on the left of the scope. All the knobs are very nicely shaped and all three are the same dimensions. There are serrations on the top 1/3 or so of the knobs which do a very good job of providing a gripping surface. This particular scope is setup in meters and mil-rads so the focus knob goes from 50 meters to infinity with marks at every 100 meters from 100-500, and then an 800 and 1000 meter mark. The spacing is larger than on most scopes making the focus granularity more precise for getting the best sight picture possible. The knob itself adjusts very smooth and uniform throughout the adjustment range and stops very positively at both ends of the adjustment range. The elevation knob is the same shape and has 0.1 milrad (mil) clicks and covers 13.4 mils in a single revolution. That equates to 46 MOA in a single revolution with 0.1 clicks. This gives enough elevation to take a 308 Win from 100 – 1000 meters at sea level in thick standard atmospheric conditions. That is impressive. The knobs have good positive clicks both audibly and with tactile feel. The numbers and hash marks can be a bit small and with a mark only every .2 mils, it can sometimes require a close look to determine if you are between hash marks or on them, but a closer look will clearly indicate which it is. The knob also has a “zero stop” as well as a stop on the top end at 13.4 mils to keep you from overlapping. With that many adjustments in one revolution and easily being able to go up and down, it is a very nice knob to use. Though some may not like the .1 mil clicks as they are a bit larger than the traditional .25 moa clicks, .1 mil equates to about .34 moa per click. For me it is a nice mix. The windage knob is just as nice with the same shape and feel as the elevation knob and the same .1 mil clicks. The knob counts up in both directions which I like, especially with the stops on the upper end again to prevent rotating all the way around. The stops are at 6.8 mils which for a 308 is enough to compensate for 20+ mph winds at 1000 yards. That should about cover most situations that one would be engaging in, though not all. One thing I did notice is that the turret shoulders are not very elevated, so a tall or bulky ring will block out the indicator mark on the scope, this was especially apparent for the windage knob. Not a negative, but something to be aware of and you can see the issue in the image above. The reticle in this particular scope was the Premier Reticle Gen 2 Mildot with the standard dots at each whole mil and then small hash lines at the half mil marks. There are also large hash marks along the thick stadia at each 5 mil increment. The reticle is in the first focal plane so it grows and shrinks with the magnification setting of the scope, making the mil spacing always accurate at any magnification. S&B and premier have done a nice job of balancing out the thickness of the reticle to be useful at all magnification settings, though down at 4x you cannot make out all the details of the reticle such as the half mil marks, which is fine as you’ll be zooming in to high magnifications to get more accurate mil measurements. I like the reticle and there is a good reason it has become so popular. In regards to the optical quality, there is not a lot to be said that has not already been said about Schmidt & Bender scopes. There is a reason they have a reputation of superb quality optics, because they are just that, superb. The picture is extremely bright, clear and sharp with contrast and all the correct colors standing out. There are other scope makers out there that probably have as good of glass, but I cannot say if there are any that are better. Of course, for the price you pay for a S&B scope, it had better have remarkable glass. We mounted the scope on a Tactical Operations Alpha-66 as well a a Remington 700P using the AI single piece mounting system for picatinny rails. 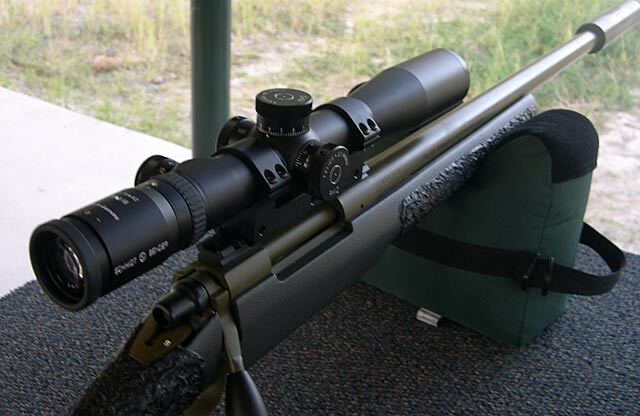 At the range the scope performed as it should with accurate and repeatable adjustments and no surprises at all. Be sure to following the instructions for zeroing and setting the zero stop and then all things should be great. Overall we were as impressed with this S&B scope as we were with the last one, perhaps even more. With the impressive precision and craftsmanship combined with excellent design the scope makes for an excellent tactical scope. The ability of having all of those adjustments into a single revolution makes for simplified operation without the loss of precision. Mil adjustments combined with a mil reticle has become popular and for good reason, again adding to simplicity without giving up accuracy. 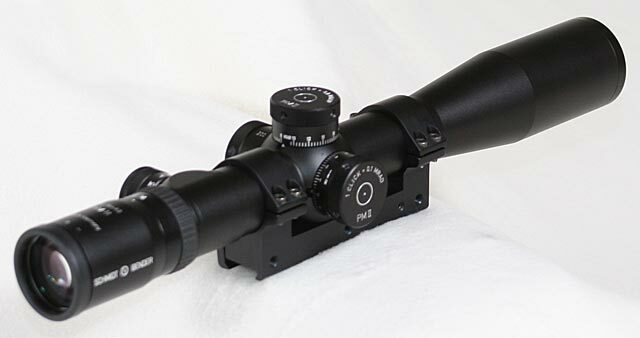 This scope is not perfect with some minor annoyances like the difficulty seeing the windage mark and power ring marks, but everything being considered, if you can swallow the price tag, this scope is excellent and should be considered for any tactical weapon system designed for rugged use and long range.